People who love fishing or love water will know how interesting kayaking is. Through this outdoor activity, you not only get the opportunity to have fun in the water with your family but you also can take the chance to get closer to the water and nature. You do not only get an ideal relaxation from your daily boring life but you also get to take part in geocaching and fishing activities. But to make your kayaking journey uncomfortable one imperfect kayak seat is enough! Yes! If your kayak seat is uncomfortable, your entire journey will be a burden to you let alone being a memorable trip. So, Kayak Seats are important. If you prepare your kayak with the ideal kayak seat you can easily take the best enjoyment out of the voyage. But how will you know which one is the best kayak seat for you? It is not possible to purchase every seat and try them to judge them. And so, here we are without own reviews of kayak seats. We present a complete list of kayak seats along with the purchasing process for your convenience. Buyers Guide: What to look for in Best Kayak Seats! 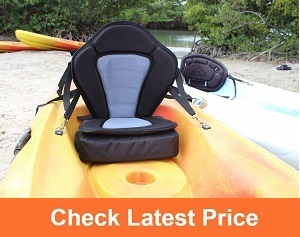 This kayak is adjustable kayak seat with padded features. This seat also includes a removable bag or backpack on the back of the seat so that yo7 can use it when you need to. This Pactrade Marine seat is manufactured for sit-on-top kayaks and it goes with most of the canoes and kayaks of this type. The seat is of high-quality and will afford you a comfy journey. The removable backpack that comes with this seat can bear most of your gears, lunch boxes and accessories. The front and the rear straps are adjustable and it also includes 4 copper hooks. The pad of the kayak is non-slip contoured. The construction materials for this accessory are 600D Polyester and Neoprene so we can say that this is the best comfortable kayak seat. Do you want support for the whole day? Go for thus Vibe Kayaks with Deluxe Padded feature. This kayak seat is fitted with rear straps that are UV protected and it also consists of front straps that are multi-adjustable. The straps are secured with solid brass-connecting snaps which are of marine grade, so no worries from now on! As additional storage, this seat also has a rear clip-on bag so that you can effortlessly take all your small needed accessories, lunch box, and other personal items. It goes with most of the sit-on-top kayaks as it has 4 adjustable straps. The detachable bad is resistant to water, so your gears are safe. The storage pouch that is given in also wax coated. It has additional back-support for your long voyage. 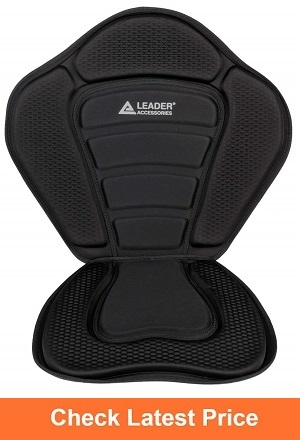 Thus Leader Kayak seat is truly a leader when it comes to competing with other kayak seats in the market. This is a deluxe kayak seat with kayak seat pad which features molded foam. It has connector snaps that are solid brass snaps and the quality is marine grade. There are 4 straps, two of them are in front and the other two is set on the rear and these four straps ensure adjustability and flexibility of wide range for accommodating most of the kayaks in the market. This seat supports your back perfectly along with incredible comfort. The webbing of the seat is adjustable. Are you searching for best sit on top kayak seat? If you are then iGuerburn can be your best bet. 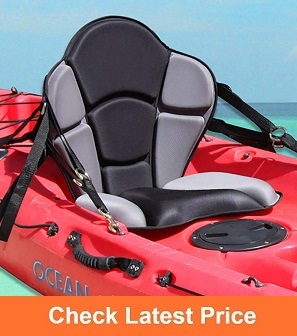 This kayak seat fits most of the sit-on-top kayaks that are available in the market. It has adjustable front and rear straps which will hold your seat sturdily in one place and will not let you fall from the boat. The seat surface is padded with a contoured design and is made of non-slip material. This seat has high backrest so if you have back pain or neck pain then this is the plus point you can ever have. This will ensure extra safety and additional comfort. The hooks are made of copper and this is constructed with corrosion-resistant material. This also features a detachable backpack for your extra gear. So NO RUST from now on only rides and enjoy! As sit-on-top kayaks are much more popular than the other types, the popular brands put enough effort to launch sit-on-top kayak seats more than the best sit in kayak seat such as Shoreline Marine does. 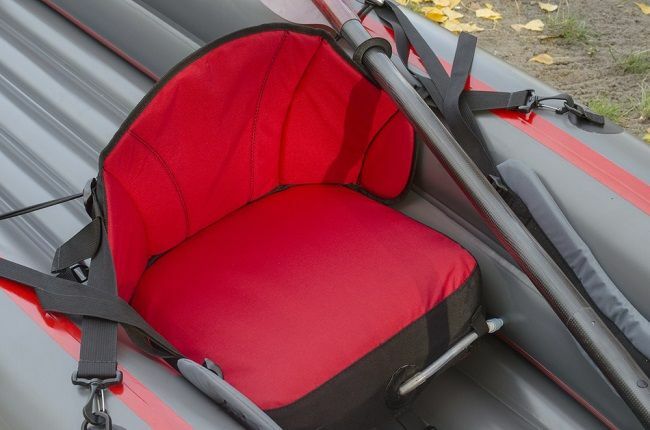 This kayak seat by this brand will go with most of the sit-on-top kayaks of these days. When it comes to the best sit on top kayak seat, we prefer this. Even for the kayak seat for back support, you can settle on this. 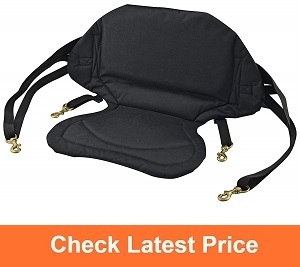 If you need proper back support or you have pain in your back or neck then this will be a perfect choice. It will improve comfort along will supporting your back outstandingly. The straps will snap effortlessly onto the kayak you have. It has a gear compartment for you additional accessories which is zippered. Brass connectors are sturdy and better than the cheap pot metal clasps. This Kayak seat by Deluxe goes exactly with the name. It has a detachable cushion so that you get the opportunity to lift it up whenever you need. The back support is rigid and the center part of the seat is deeply molded. It is contoured with molded black foam with perimeter padding. For solid positioning and prevent slippage, it gives wide rear straps. The backrest is of 18 inches and it comes with one zippered detachable backpack. With the backpack, you get two-rod holders. Do you have a sit-on-top kayak and do you need an adjustable seat for that? 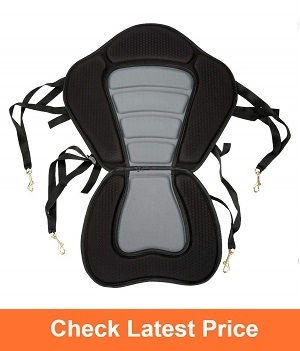 Or do you need the best kayak seat for back support? If you do then Ocean Kayak brings Comfort Tech Seat Back which will afford you all the features of an ideal kayak seat. This seat has got extra padding facilities to provide you with a comfy seating throughout your long outdoor experiments. It also consists of a ventilation system which is a built-in facility of this specific seat by Ocean Kayak. The logos of this seat are reflective. Are you tall? 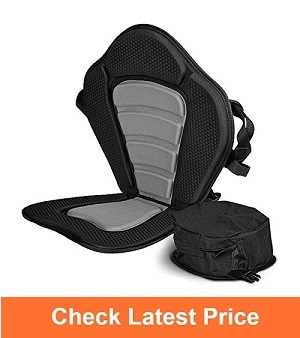 If you are tall then without any worries select this because along with extra padding this provides you the opportunity of the additional seat back support for your neck and head. So no more pains! The construction material includes Nylon Pack Cloth which is UV protected and durable. 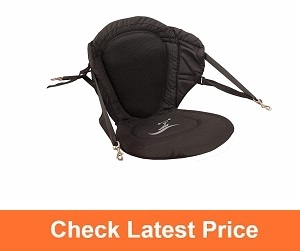 The mounting straps have four-way adjusting feature. There are also brass buckles of swivel technology as attachments. The best sit on top or the best sit in kayak seat, no matter what, Brooklyn is the best brand! This kayak seat by Brooklyn Kayak Company will be a perfect selection because the flexibility while positioning this seat is amazing. This is because of the four-way adjusting feature that leads you to customized comfort with which your kayak and your body can adjust. The design of this seat is durable. If you are thinking about long-term use then purchase this as it is made of a rugged blend of fabric. The hardware is corrosion resistant. The seat surface and the backrest is cushioned and so you get the utmost comfort while paddling for a long time. The installation of this kayak seat is easy and so you can install this in around 1 minutes. Are you tall and no backrest suit you? The best comfortable kayak seat for the tall kayakers, 18 Inch tall backrest is provided with this Kayak seat by this GTS Expedition. The bottom seat is 2 Inch thick which will afford you unrivaled support. The customized comfort will be ultimate with the rear attachment of 6 points. The drainage channels of the bottom of the seat will easily funnel the excessive water of the cockpit. 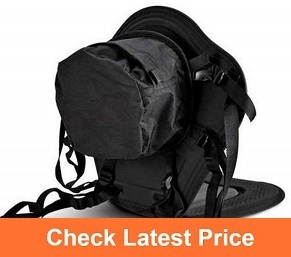 A mesh bungee pouch bag is provided with the seat so that you can store your extra gear. Most of the kayaks and canoes of the market will perfectly suit with this sit-on-top kayak seat by Kerco Angler-x. The extra thick padded seating surface will comfort you throughout the long journey. 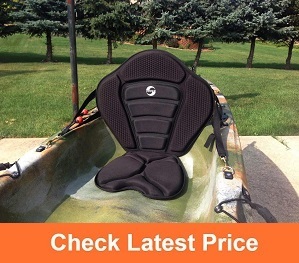 This is considered as the best kayak seat pad in the market. The padded surface is soft enough to make it comfy but sturdy enough to serve for years. The anti-slip padded seat surface is contoured. The seat consists of a high backrest that will lead you to painless back and neck. This also ensures additional safety and comfort in any water condition. 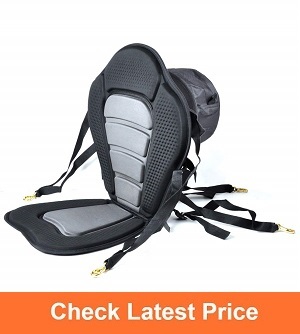 The rear and front straps are adjustable and the clips are anti-corrosion. The seat is made of molded Nylon or Dura-foam. You will get a detachable backpack with the zippered facilities with this kayak seat so that you can store your extra attachments. Before you are heading out for purchasing the kayak seat for your very own kayak, get a list of your own. What are your requirements for your kayak seat and what are you going to avoid, know your needs first. If you are looking for specific things like additional stability, additional storage or additional storage then you can easily find your desired kayak seat in the market. Things you need to keep in mind while buying Kayak Seats are given below, go through them and find your one! When you are on your kayak and you are taking the fun of breathtaking natural views, the slightest shift in the weight can turn into a reason which will make you fall down into the water. So, an ideal balance of your body weight so that it can hold your body above when you are on the water should be the foremost concern as it protects your life! Stability of your kayak seat is essential when you are riding a kayak. As you are using the torsion of the lower body so that you can maneuver the kayak, being stable is important. When you will add extra stability to the cockpit of the kayaker, the high back seats and the deluxe will let the angler edge the device into tighter turns along with greater ease. Additional comfort is perfect when you are up for touring, recreational kayaking or fishing. These activities will lead to you spend a particular time when you're on the water. For comfort through this entire time, you will require some specific features in your kayak seat. If you are a recreational kayaker, you can easily adjust with the basic seat with some added paddings. But if you are touring then you can get the best bet if you select a seat that has back support along with a high back seat or deluxe. The shape of the cushioning also matters. Thick cushions are the best choice as it will support your body but it will not get soft day by day. To catch the distant fish and to fish in any new water, the comfort of seating is crucial. If you want the best kayak seat then you have to ensure adequate padding system on the bottom of it. As you legs need some necessary circulation, this will help to do that. You will get a range of cushioning available where the commonly used patterns are strap-on seat cushions and self-adhesive cushions. Additional storage is specifically crucial to the anglers and kayakers who need to bear extra gears with them. Additional storage system lets them keep more of their equipment for fishing in their kayak. They anytime may need their gear and they need them within their reach. The storage compartment is usually seen on that high-backed seated kayak as they can lend extra room for storing stuff. If you are buying kayak seat with money then you have to think about the durability of that product, each product should be the investment that serves you for the long term. Longevity of kayak seats generally depends on its construction method and material. There are kayak seats that will provide you with a heat-resistant quality. Some other will serve you material that has a UV-resistant feature which means it will never fade away. The warranty for kayak seats is also crucial as it itself will tell you about the quality of the product. If it has a long-term warranty then you can get your kayak seat replaced or repaired with that. What are kayak seats called? Kayak seats are the seats that can fit the kayak or boats like a kayak. These seats are usually comfortably built with durable material so that they can serve you comfort and support throughout the long journey. Different brands have different kayak seats available in the market that will match your kayak perfectly. How many seats does a kayak have? There are different types of the kayak in the market and on the basis of that kayaks are divided into different types such as one person kayak, two-person kayak or tandem kayak and 3 person kayak. Kayak seats are also available on the basis of kayak types. The 3 seated kayaks are not much popular if you want you can also place an additional kayak seat on the back or on the cockpit if you want. Every kayak has a maximum weight lifting capacity and the gear along with the over-all weight should not cross that limit. When you are in an inflatable kayak then you have to first know how many people is going to ride the kayak. If you are riding a tandem or 2 people kayak then place the seat of the seasoned kayaker in the back and place the other kayaker in the front so that the experienced kayaker can have complete control over the kayak. If one person is going to ride the inflatable kayak then the kayaker need to place the seat in the middle. All you have to think is keeping the balance of the kayak while placing the seats. How to install kayak seats? The installation process of kayak seat is easy if you can do it properly. You have to add the first straps that are placed at the top-in-front of your seat. The second straps also need to get attached that are placed behind the seat in the bottom. Now select one place for attaching the seat. Fix the seat into your kayak and let the backrest against the area of the kayak. Now attach the clips properly and recheck it. Then all you have to do it tighten the straps till it makes you satisfied. How to select seats on a kayak? There are different types of kayak and before choosing one seat for your kayak get to know your own requirements. There is a range of kayaks such as sit-on-top, sit-in, inflatable kayak, touring kayak, sea kayak, whitewater kayak etc. What do you need? Comfort, stability, durability or what! According to that select any seat and purchase that. What other seats fit the lifetime youth kayak? Kayak seats are best when you find the same branded and model kayak seat for your kayak. Lifetime Youth, being one of the best kayak brands in the market, should sell their own manufactured kayak seats. But this brand does not sell seats so if your seat is flawed or you want to change the seats then you have to specify the features of your Lifetime Youth kayak and then select any other branded kayak seat that suits your Lifetime kayak and attach that. Just like Kayaking is important, kayak seats are too! Going on any voyage or outdoor journey needs safety and when you're on the water and in the kayak, kayak seats are the safeguard. So select wisely.